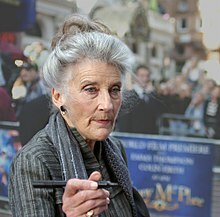 Phyllida Ann Law, OBE (born 8 May 1932) is a Scottish actress, known for her numerous roles in film and television. Law was born in Glasgow, the daughter of Megsie "Meg" and William Law, a journalist. She was married to actor Eric Thompson from 1957 until his death in 1982. Their daughters, Emma and Sophie Thompson, are both actresses. Law has worked extensively in television, including appearances in Dixon of Dock Green, Rumpole of the Bailey and the 1972 adaptation of the Lord Peter Wimsey tale The Unpleasantness at the Bellona Club. She appeared in films such as Peter's Friends (1992), Much Ado About Nothing (1993) (playing Ursula, alongside daughter Emma as Beatrice) and The Winter Guest (1997) (playing Elspeth, alongside daughter Emma as Frances). She was in the original London cast of La Cage aux Folles at the London Palladium in 1986, playing the role of Jacqueline. In 2004 she guest-starred in the Rosemary & Thyme episode entitled "Orpheus in the Undergrowth" as May Beauchamp. In 2007 she guest-starred in two Doctor Who spin-off adventures: as Bea Nelson-Stanley in The Sarah Jane Adventures story "Eye of the Gorgon" and as Beldonia in the audio drama Doctor Who: The Bride of Peladon. Also in 2007 she played Aunt Auriel in the drama Kingdom starring Stephen Fry. In 2008 she appeared as a guest star in Foyle's War. In November 2009 Law published her first book. Notes to my Mother-In-Law concerns the 17 years Law's mother-in-law lived with the family from the mid-1960s until her death. In January 2010 she appeared with Tony Slattery on Ready Steady Cook. She starred alongside John Hurt in a short film entitled Love at First Sight which was shortlisted for an Oscar in 2012. Phyllida Law (centre) flanked by her daughters Sophie Thompson and Emma Thompson on receiving her OBE at Buckingham Palace. Phyllida Law receives the honorary doctorate from the hands of Muhammad Yunus, chancellor of Glasgow Caledonian University (July 4th 2013). In 2013 Law received an Honorary Doctorate from Glasgow Caledonian University and an Honorary Doctor of Letters from the Royal Conservatoire of Scotland. She was appointed an Officer of the Order of the British Empire (OBE) in the 2014 Birthday Honours for services to drama and for charitable services. Law, Phyllida (2009). Notes to my Mother-in-Law. Fourth Estate. ISBN 978-0007338412. Law, Phyllida (2013). How Many Camels Are There in Holland? : Dementia, Ma and Me. Fourth Estate. ISBN 978-0007485864. ^ a b "Phyllida Law profile at FilmReference.com". Filmreference.com. Retrieved 22 December 2011. ^ Swann, Yvonne (20 February 2010). "Me and my school photo: Phyllida Law remembers her childhood as an evacuee". Daily Mail. London. Retrieved 4 October 2014. ^ "La Cage aux Folles - 1986 West End - Original West End Cast". BroadwayWorld.com. 9 October 2011. Retrieved 22 December 2011. ^ "The Bookseller". The Bookseller. Archived from the original on 29 February 2012. Retrieved 22 December 2011. ^ Ford, Rebecca (14 December 2011). "10 Live Action Short Films". The Hollywood Reporter. Retrieved 24 January 2012. ^ "Actresses collect degrees together". BBC News. 2 July 2013. Retrieved 12 July 2018. ^ "No. 60895". The London Gazette (Supplement). 14 June 2014. p. b13. Wikimedia Commons has media related to Phyllida Law.